Trump's latest tweet directly contradicts remarks he made during a May 2017 interview with NBC News’ Lester Holt. President Donald Trump on Thursday claimed he did not fire James Comey as director of the FBI because of the agency's investigation into Russian interference in the 2016 election, contradicting prior statements the president has made about the termination. “Not that it matters but I never fired James Comey because of Russia!” Trump tweeted Thursday morning. “The Corrupt Mainstream Media loves to keep pushing that narrative, but they know it is not true!” he added. But that's not what Trump told NBC News’ Lester Holt in May 2017. In a televised interview, the president directly admitted he’d been planning to fire Comey — even before he received Deputy Attorney General Rod Rosenstein's recommendation to do so — because "of this Russia thing with Trump." “I was going to fire Comey knowing, there was no good time to do it. 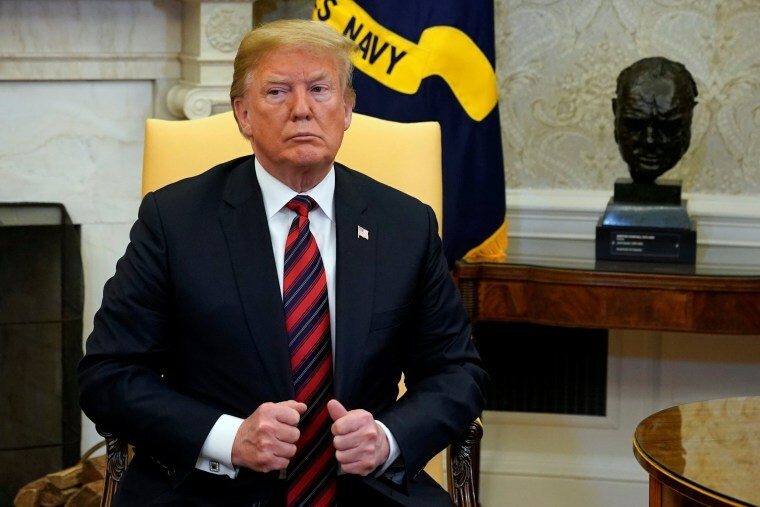 And in fact when I decided to just do it, I said to myself, I said you know, this Russia thing with Trump and Russia is a made up story, it's an excuse by the Democrats for having lost an election that they should have won,” Trump told Holt. Trump’s latest tweet on the issue comes just one day after The New York Times reported that former FBI Deputy Director Andrew McCabe drafted a memo on the circumstances leading up to the firing of Comey, his onetime boss. Trump’s latest tweet also contradicts statements made by Rudy Giuliani — the former New York mayor who Trump hired to join his legal team last month — that indicated that the president’s decision to fire Comey was in fact related to Comey’s decision to not publicly clear Trump in the Russia probe. "He fired Comey because Comey would not, among other things, say that he wasn’t a target of the investigation," Giuliani said this month on Fox News “Hannity.” "He’s entitled to that. Hillary Clinton got that. And he couldn’t get that. So he fired him. And then he said, 'I’m free of this guys.'"